Twins Crystal and Amber have the same goal: to be the first in their family to graduate high school and make something of their lives. When one gets pregnant during their junior year, they promise to raise the baby together. It’s not easy, but between their after-school jobs, they’re scraping by. Crystal’s grades catch the attention of the new guidance counselor, who tells her about a college that offers a degree in automotive restoration, perfect for the car buff she is. When she secretly applies - and gets in - new opportunities threaten their once-certain plans, and Crystal must make a choice: follow her dreams or stay behind and honor the promise she made to her sister. Today, I'd like to welcome J.M. Kelly, the author of Speed of Life to my blog. J.M. is here to talk about one of her hobbies, building miniatures. When I'm writing a new book, there comes a point where I'm so absorbed in it that I can't do any of my normal after-work past times, like read, or cook anything fancy ... or clean the house. And that's when I turn to visual arts. I wouldn't say I'm great at painting or drawing, but it's fun to do and it's a release from words, plots, and characters. It takes all my attention because it's not something I do regularly and it gives my brain a break from thinking about the story. One of my favourite things to do is build miniatures. My college degree is in Theatre Arts and at university I had to take stagecraft and scene design. We learned to build dioramas which I found really fun. A few years ago, when I wanted to have a writing cabin constructed for me, I first built a small one to scale out of foam core. I painted it with kids' poster paints, mixing the colours like I used to do in Grade 7 art class. You can see a video of it here. My friend is an architect and she and I took it out into the yard with her husband, the builder, and we positioned it in different places on our property, deciding on the building spot and turning it in different directions to get an idea of good placement, which was actually pretty cool and not anything I'd intended to do with it. I have such clear pictures in my head of places I imagine and all of my books are like little movies in my head. 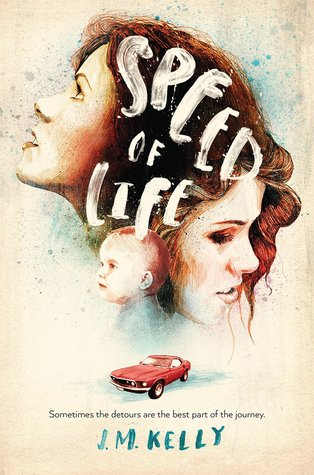 Speed of Life is so visual to me, and I hope it comes across to readers, but in my head, I know every detail of the place Crystal, Amber, and Natalie live in, so I decided it would be fun to build it in miniature. First I laid it out on paper, planning to build the whole house. 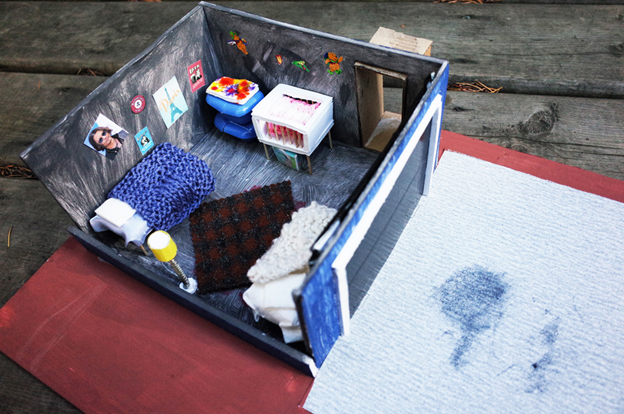 But then I realized even at a small scale (1/2" to the foot), it would be pretty big, so I decided to build only the garage-bedroom that they share. I laid it out on a board that was big enough to include the driveway, too. I had plans for that driveway. If you're looking at it in person, you can see a lot more detail, but even these pictures give you a good idea of my vision. Some things are more "representative" of what they are supposed to be, and others look a little more realistic. This is because I'm pretty much winging it and trying to have fun, not judge my abilities as an artist. After all, it's something I do to relax. I figure building miniatures is a lot like cooking…if you want a perfect cake, go buy one. If you want a delicious, homemade cake with ingredients you know about, make one and who cares if it's slightly lopsided? 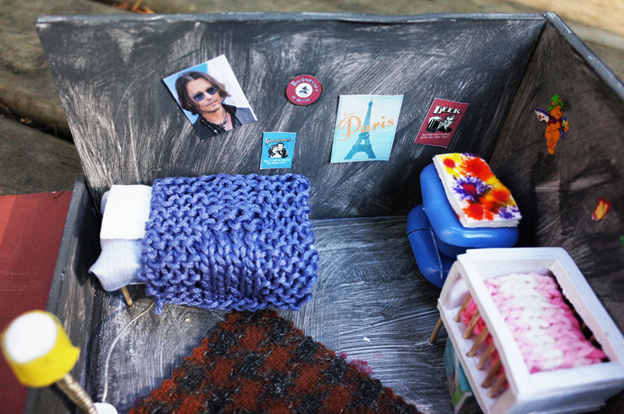 I knit the bedspreads for the beds and the crib, but I printed out tiny pictures to make the posters on the walls. It was great fun choosing decorations for each side of the room depending on which girl slept where. And I printed out a tiny picture of pampers to make the box of diapers, cut up an ice cube tray to make Rubbermaid storage containers, and used a scrap of old material for the rug. The rug covers a stain Crystal made when she worked on a car part in their bedroom (it might look like I spilled paint there, but I admit nothing). I'm not sure if the toothpick legs on the crib could actually hold Natalie without collapsing, but they look okay! The reason I included the driveway (and the oil stain) is because like Amber, I have ambitions that there will be a cool Mustang parked there. I bought a plastic model kit last spring that my husband and I were going to put together, but do you know how many pieces those models have in them? 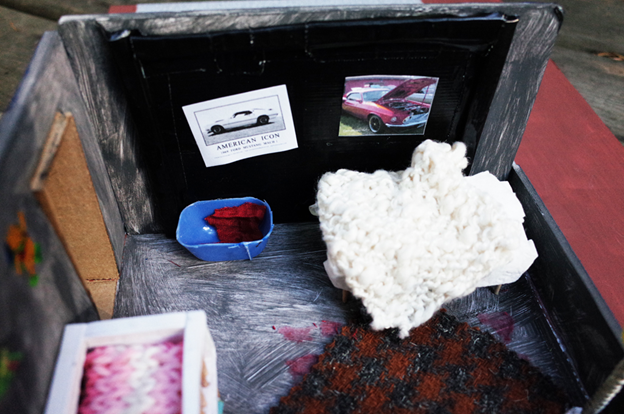 Probably as many as a real car, except they're tiny! I could write another novel in the time it would take to put it together. I'm seriously considering making a paper mâché car. Or possibly I'll just make some tiny bricks and primer the model and "put it up on bricks." Everyone who restores cars seems to have at least one that doesn't run, up on bricks, somewhere in their yard. Why not Crystal? I have a terrible time visualizing settings so these photos should definitely help me with picturing Amber and Crystal's bedroom. Thanks for dropping by, J.M.! A bit about J.M. (as found on Goodreads): J.M. 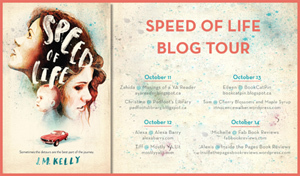 Kelly is the YA pen name for the children's author Joelle Anthony. She loves the rain, which is good because she was born and raised in Portland, Oregon and now lives in British Columbia, Canada. She spent her childhood with her nose in a book, often in the backseat of whatever old car her dad had at the time. She's worked as an actress, a Minor League Baseball souvenir hawker, the Easter Bunny, and various other not-so-odd jobs. Now she mostly writes novels, but she still dabbles in sketch comedy, nonfiction articles, and teaching writing to both kids and adults. She recently wrote and starred in her first full-length play, along with her husband. Books by Joelle Anthony include: Restoring Harmony, The Right & the Real and the forthcoming A Month of Mondays. How fun! I've done dioramas before, but years and years ago. I think it would be great to do rooms that were important in a book I was writing. I can see how this would be a nice "getaway" from writing. This was SO cool. I loved seeing the author's vision of the bedroom. I have been eager to read this book- now I am even more excited to get my hands on it.